Sometimes I encounter something wonderful just by chance and I think "That sure was lucky!" For instance, I might happen to glimpse a gorgeous sunset only because I had to wait for the last wayward chicken to finally make her way into the coop. Or, I might have arrived at a bakery just as they take something scrumptious out of the oven, piping hot and delicious. I'd say I was lucky! It has happened more than once when I have said this, that someone has "corrected" me by saying "You were blessed." This is a comment I find more than just annoying. It's true that I was and am blessed - because God loves me and blesses me, not for any merit of my own, but because it is in His nature. It seems to me that insisting that these things are not lucky occurrences but blessings shows a bit of misunderstanding about who God is and what His blessing does for us. It suggests that God is "up there" looking for ways to reward nice people with pleasant things because they believe in Him. And it suggests that He does not bless those who are less good. This is a gross misunderstanding of God's nature. Our purpose in life is to know, love and serve God in this life that we may be happy with him forever in the next, not to believe in God's goodness in order to have nice things happen to us. I say some correcting of this misperception could be considered a spiritual work of mercy on my part! It is in that spirit I will continue my harangue. God loves all His people. He loves every person He has ever created - whether they know Him or not, whether they live according to His principles or not. He even loves the ones who have given themselves over to evil. Even people we think we're better than. He loves us all before we are good. That a person exists shows that God is, at every moment, blessing him or her. He loves each of us into existence every instant. I have also observed that sometimes God's blessings are, shall we say, unpleasant to experience. Remember when you prayed to become more patient and God gave you an opportunity to exercise greater patience in order to grow in this virtue? Well, that miserable opportunity was a blessing. But probably no one said "Wow! You sure are blessed!" Probably you didn't think, "Boy am I lucky!" In fact, you were not lucky, but you were blessed. There is not a power or force called "Luck" that affects peoples' lives. On the contrary! When I say, "You're lucky," I mean that something nice happened for you that doesn't happen for everyone. Luck is when God's blessings for you happen to be things you like and enjoy while they're happening. Another word that works is "serendipity." "Blessed are they who mourn." This distinction is more important than you may think. If you insist that every good thing that happens is a visual sign of God blessing you for your faith in Him or your virtue or whatever, it can be very easy to slip into thinking God works on a system of rewarding good people who please Him and punishing those bad people who don't please Him. Well, all it takes is a look into the life of any canonized saint to see that the holiest people generally aren't the people who have the most nice things happen to them. Sure, there are some holy people who happen to have lovely lives - but they are the exception. They are lucky! And I challenge you to show me a canonized saint who did not experience suffering and, in fact, receive it as a blessing. This we see in the life of St. Paul. "And to keep me from being elated by the abundance of revelations, a thorn was given me in the flesh, a messenger of Satan, to harass me, to keep me from being too elated." (2 Cor 12:7) We see that the "thorn," was unpleasant and was allowed by God to afflict St. Paul. The Catechism of the Catholic Church says, "But even the most intense prayers do not always obtain the healing of all illnesses. Thus St. Paul must learn from the Lord that "my grace is sufficient for you, for my power is made perfect in weakness,' and that the sufferings to be endured can mean that 'in my flesh I complete what is lacking in Christ's afflictions for the sake of his Body, that is, the Church.'" (1508). God's blessings are not always what we want or pray for, but they're always for our good. We know this because we know God. We know that He is all that is good. "'God is Love' and love is his first gift, containing all others. 'God's love has been poured into our hearts through the Holy Spirit who has been given to us.' (Rom 5:5)" (CCC 733). I have no idea why God gives some people nice blessings and others blessings that they may actually have prayed to avoid. It's not my business to know why. It's enough for me to trust on my knowledge of who God is and that He knows what He's about. Remember the story of Job? 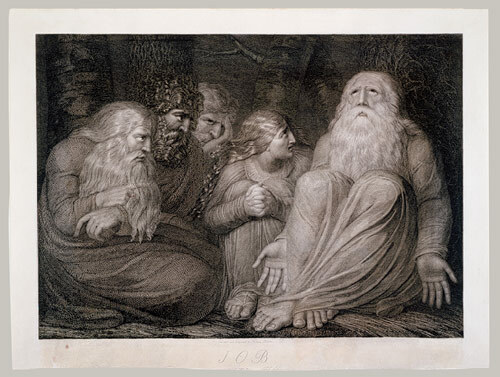 If you don't know it, read the Book of Job in the Old Testament. He endured great suffering of every kind. His friends suggested that it must be because of his sins that God had afflicted him. They probably went around telling people who said, "Boy, am I lucky!!!! ", "No, you're blessed." Luck is just the word we use for when pleasant and unexpected things happen. If you happen to be someone whose prayers have all been answered with the good things you wanted, lucky you! God blesses us all - all the time - because He is love. We will never fully understand what He's up to beyond that it is good for us. Our response to His inexplicable love is where our salvation lies.